Magic: The Gathering‘s War of the Spark expansion is gearing up for release later this month both in physical tabletop and digital Arena form, and we have an exclusive card reveal today: God-Eternal Bontu. If you haven’t been following along, current Magic big bad Nicol Bolas is declaring all-out war against the Planeswalkers after acquiring a series of magical artifacts. 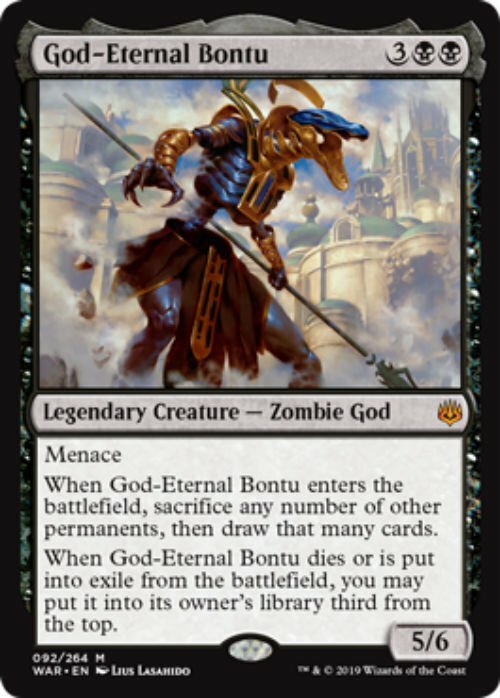 Bontu, the God of Ambition in the Amonkhet plane (also a previous ancient Egyptian-themed expansion for Magic) tried to destroy Hazoret, the God of Zeal, under orders from Bolas, but failed and was corrupted with a zombie form. Now you get to play it. Basically it’s a five cost (two swamp, three non-colored) legendary creature with the zombie god trait and the menace (more than one creature is required to block it) keyword. 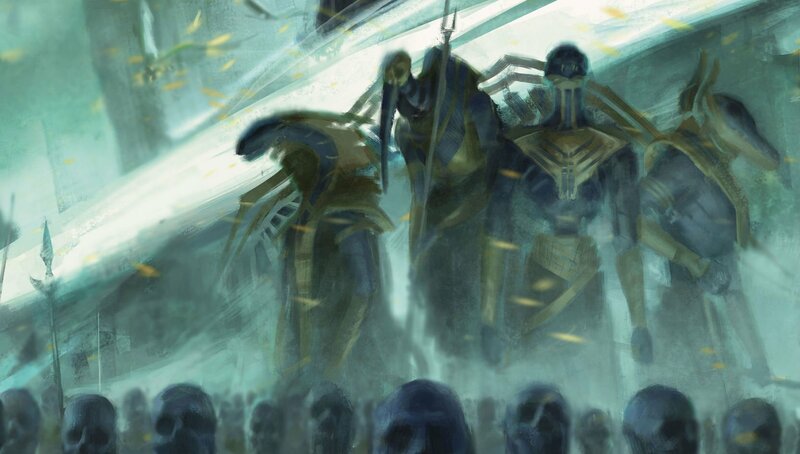 Provided it’s not countered, when it enters the battlefield you can sacrifice any number of other permanents (not just other creatures) to draw that many cards. If Bontu dies or is exiled on the battlefield, you can put it on your library (owner’s library is key, in case it gets stolen) third from the top. It’s kind of a play on the Amonkhet eternal keyword. As-is Bontu is kind of expensive for constructed play, but is absolutely going to slay in zombie token decks where you can hit that card advantage quickly when you need it (it reminds me of Champion of Dusk in that way and even has the same cost!). It’s also a good midrange option as you can keep re-summoning it. But I think Bontu is going to be decent in limited (draft/sealed for example) as a game-ender. Whatever your take is you can check the card out below.